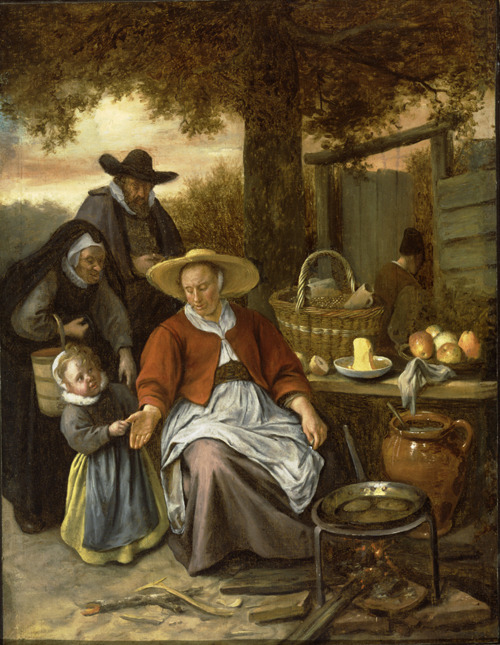 Jan Steen’s ‘The Pancake Woman.’ Memorial Art Gallery. Pancake vendors, much like outdoor food vendors today, were a common sight on Dutch streets during the 1600s. Originally a delicacy prepared on the festival day of Shrove Tuesday, the last day of Carnival and the day before the beginning of Lent, pancakes were associated with feasting and wild behavior. Images of pancake makers were initially moralistic in nature, symbolizing gluttony and lust. By the 17th century, pancakes were eaten every day and the theme lost some of its allegorical significance. The scene retained its popularity among painters and printmakers of “low-life” genre scenes, or scenes of everyday peasant and street life. Being me, and loving both food and research, I was then inspired to look up the history of pancakes, and found that someone else had already done the bulk of my work for me. There is an entire site dedicated to the history of food! Here is their article on pancakes, but I invite you to explore because it’s a really interesting, quality resource. Reblogged this on Holland Traveler .Me.